"Holiday creep" seems to be a popular thing to complain about these days, and with good reason. I do have to admit that I'm not particularly bothered by stores rushing the seasons -- while I may not act on anything until the last minute, I do think ahead about holidays and seasons, and I am absolutely pondering Christmas in September and dreaming of spring pastels in January (though it DOES bother me when I can't find fall-themed anything a week before Thanksgiving, or a winter coat in February...sure, bring the stuff out early, but can't we KEEP it there until the relevant time of year?). So while I can't get behind putting up Christmas decorations in October (sure, have the merchandise, but save the decked halls until at least November, please), the rest of it doesn't bug me all that much. I have bigger things to worry about. Anyway, I don't usually shop on Black Friday just because it doesn't appeal to me and there's nothing I need that badly, but this year I was so annoyed by the whole thing that I decided to ACTIVELY not shop. So instead, I had a few friends over for Black Friday Crafternoon! I am hoping to make at least some of my Christmas gifts this year, and figured that Black Friday was a good day to work on some of that...and why not do it with friends? I can't speak for the others, but I had such fun, I totally intend to make this an annual event! Mostly we knitted (although we had one preteen artist and and some Shutterfly photo calendar creation -- totally a craft!) but if we'd gone longer, I think eventually I would have busted into the paper crafts. And of course, we ate. Unfortunately, it did exclude friends who had to work, so maybe next year I'll have to have a Friday AND Saturday session? And maybe I'll have a project or two for everyone to do together? The possibilities are many! My camera didn't make it out the whole time, but I did take a picture of what I made. 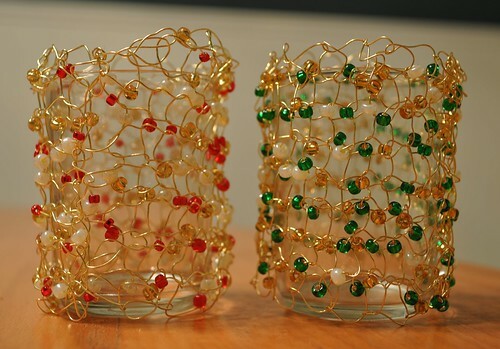 These are inspired by the beaded votive holders in Melanie Falick's lovely Handknit Holidays, but really, they're just stockinette rectangles, knitted until they're long enough to wrap around your glass votive holder (or whatever else in your life needs a sparkly beaded sleeve). I'd made the red one previously; the green one was done in its entirety today. 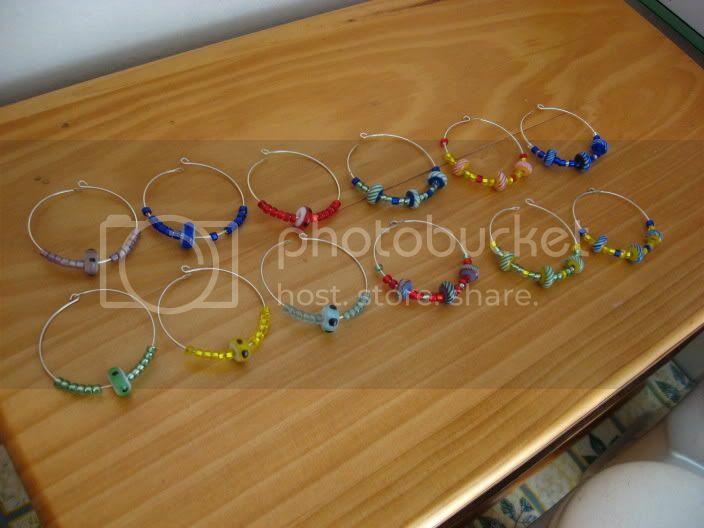 These are knitted on 26-gauge beading wire; I used size 9 needles. 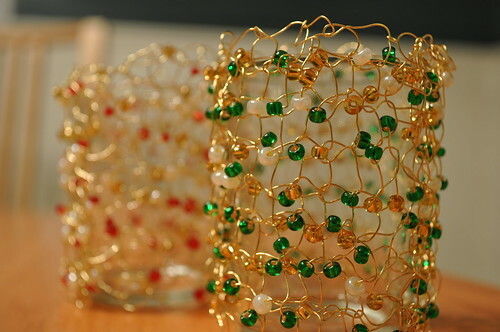 When I made the first one, it took me a while to find a good method of holding everything so that the beaded, coiled wire didn't get hopelessly tangled up, but now that I've worked out the kinks in my technique, these go VERY quickly. I honestly think that stringing all the beads onto the wire takes longer than the actual knitting time! These two are for my own holiday decor, but I definitely see more in my future. Maybe you'll be getting one under the tree this year! 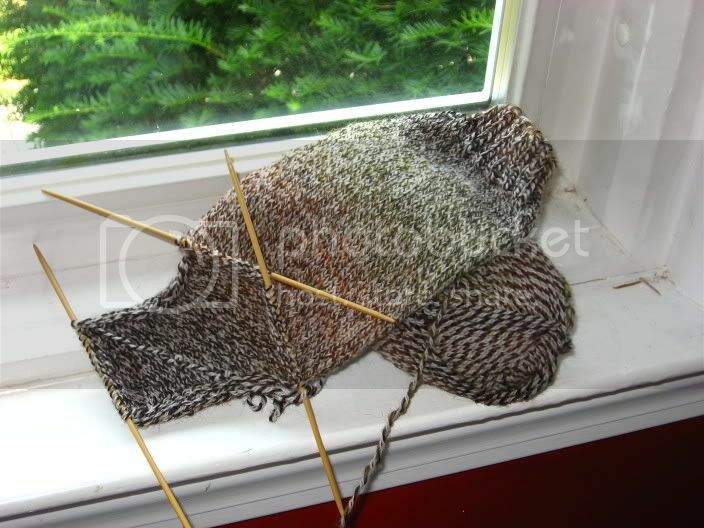 I hope to pick up the gusset stitches tonight, maybe. We'll see.